Electronic team working hard on the PCBs. Electronic team working hard on the PCBs. Since our courses finished we are working full time on the ISAAC project. I finished the Schematic design for digital part of the Infra-Red circuit and now I am working on layout of the Power_Top. 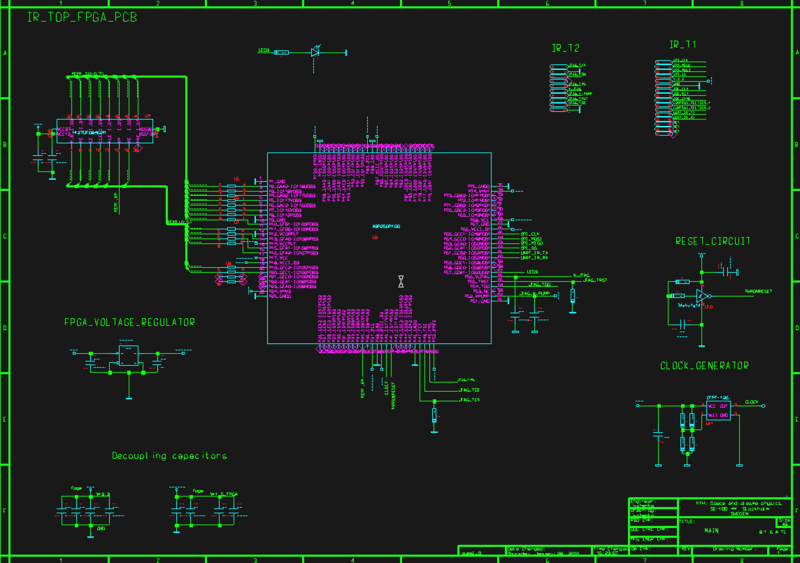 Here is the Infra-Red schematic or IR_Top. It contains of different circuits; FPGA, memory, regulator, clock oscillator, reset and connectors. In the next picture you can see the Power_Top layout. It is not done yet but I hope to finish it during this weekend. This layout required more work in compare with a normal design. We had some changes of the connector’s placement and the board size. I had to start from the beginning for two times. The reason was loading error, when I tried to open the saved design. I learned to be patient with this tool and every time drawing became faster than before.